Hello! I am Bogdana. My mother is an artist, and my father is an engineer as well as entrepreneur. My family has been living in Slovakia for several years already. I know Slovakia is a good neighbor of Ukraine. I am in the third grade at school for gifted children within Aprogen national Slovak program to support talented children. I also study music at the elementary art school in Kosice. At the municipal and school competitions, I always use Ukrainian language, show traditional elements of Ukrainian culture and history, and that of my home city Kyiv. I actively participate in the events organized for children by Ruthenian-Ukrainian Union of the Slovak Republic. 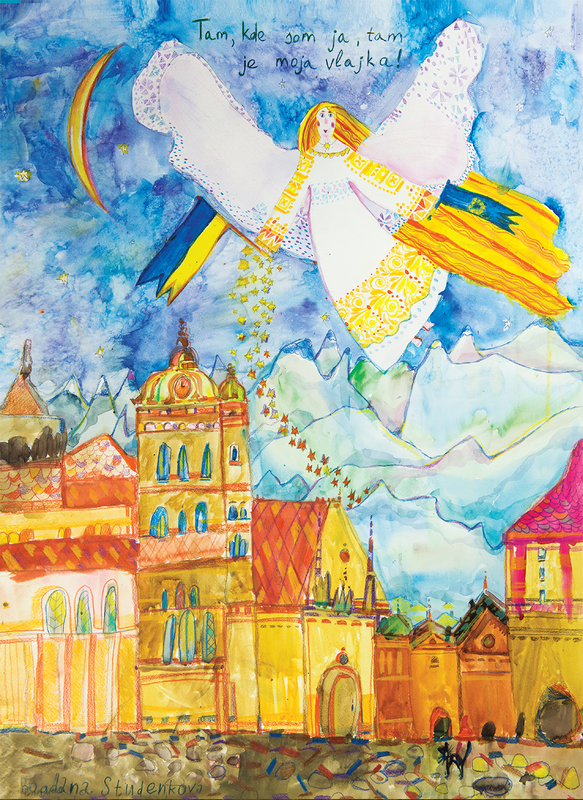 The overall theme of the painting “Angel over the city” is the image of the city of Kosice, where I live now. The most famous town`s landscape is St. Elisabeth Cathedral. In the sky, the angel spread his wings bestowing people with peace and harmony seeding golden stars all around. I used Slovak folk motifs of lace and embroidery when decorating angel`s fi gure. The painting shows two banners – Ukrainian and the fl ag of the European Union. They are the symbols of solidarity and the future that I wish for my country.